Big ideas divide us. The path to progress lies through small ones. For me it is the great turning point in modern thought. In the 1930s the philosopher Ludwig Wittgenstein (pictured in a 1947 photo by Ben Richards I picked up off Wikipedia) rejected his early, grand philosophical work on the fundamental questions of logic and mathematics. Instead he developed an entirely new approach using the slogan “Don’t ask for the meaning, ask for the use”. 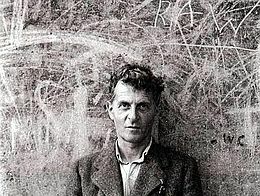 While I am only dimly aware of Wittgenstein’s philosophy it is one my life’s chief inspirations. Perhaps it is natural for people to search for big ideas. Systems that allow us to make sense of our world in simple terms, and which can guide us into big sweeping changes. We look for these ideas everywhere: in religion, in politics, in science, perhaps even in art. But there is only one big idea: there are no big ideas. This is reasonably commonplace in the field of religion, amongst those of modern, western sensibilities. Many religions aspire to be big ideas, or have done so. They claim their messages are for everybody, and that the only way ahead for the world is if everybody follows them. They are based on sacred insights, often inspired by the direct word of God, which are preserved in sacred texts and traditions. But there is no way of resolving which of these sacred ways is the right one. Their reach simply cannot be universal. So it is necessary to scale back their ambitions. What is the use of religion? It helps us make peace with the world in which we live; it inspires more ethical and socially useful behaviour; it encourages us to be kind to strangers. All the world’s major religions can do this. To the extent that they fail at these small things, religion does harm. Another big idea should be looked at in the cold light of day: what might be called modern scientific Enlightenment thinking; it remains persistent. This was of direct concern of Wittgenstein, whose earlier thinking was taken up by logical positivists – people who seek to exclude the unverifiable from human discourse. How often do I hear pleas for things to be “evidence-based”? Or people sneer at alternative medical therapies because they are “unverified”? And yet the system of scientific verification is no absolute (what do we actually mean by “verification”), and has many weaknesses. It can only deal with relatively simple propositions, and in situations that are repeatable. But the world is complex and every situation is in some way new and unique. Our understanding of our world needs more humility. Homeopathy, for example, is nonsense as a big idea. But can it be useful? Because it is holistic in its approach, unlike conventional medicine, the surprising answer to that is: “Sometimes”. And politics? It should be obvious that the day of big ideas is over. Communism was a big idea; Nazism was a big idea. These both led to the systematic destruction of lives for nothing. Even the more modest ambitions of social democracy and free market liberalism have been shown as flawed, offering incomplete answers at best. And they generate conflict. And that, at bottom, is the problem with big ideas (or, perhaps, why they are not useful). We will never agree on them. Because of their scope that leads to conflict. And yet a great diversity of people can agree on little things: helping the needy; preserving the peace; civilised dialogue; and even ethical behaviour. But if we try and turn these small ideas into grander ones (for example a universal code of ethics) they will fail. It is through everyday, small-scale negotiations over practical and worthwhile things that progress will be made, where harmony will emerge from discord. Wittgenstein’s later work focused on language (as did his earlier work, but in a different direction), and rightly so. It is here that philosophers can be of most help. Everywhere we see the abuse of language creating problems. “Islam” means different things to different people, and yet we talk across each other is if its meaning was universal. Recently I blogged about the problems that arise from the use of words like “economic growth”, “inflation” and “deflation”, that are taking even professional economists into silly places. And political activists tilt at words like “neoliberalism” or “socialism” or, even, “Europe” as if they meant something real and useful that people understood – and then wonder why nobody is listening. So: don’t ask for meaning, ask for the use. And a small step at a time we can make this world a better place. I dunno, I would be a bit ashamed to reveal that one of my life’s chief inspirations was something I was only dimly aware of. I mean, is it lack of curiosity? An assumption there can’t possibly be anything else you could learn (from Wittgenstein)? An unshakable conviction that despite only being ‘dimly aware’ (presumably through secondary sources) there’s no possible way you could have misinterpreted and be making a fool of yourself? Or a fear that you have misinterpreted, but you prefer your misinterpretation and would rather not investigate too deeply and find out what he was actually saying? You might be a bit ashamed, but I am not. I read a book about philosophers in the late 1880s, and the chapter on Wittgenstein opened my eyes. It, and in particular that saying, proved a window into a whole new way of thinking. And yet Wittgenstein’s philosophy does not have the reputation of being particularly accessible to amateur philosophers like me, and I wasn’t sure how much use I would derive from more reading it. And life moved on. I don’t think it was one of my better judgements, and it is something I hope to put right. But I find the premise of your comment rather strange. It doesn’t really matter whether I misinterpreted Wittgenstein. The possibility that I had misinterpreted him is why I had to put in the caveat that I’m not an expert on his work. I am open to being corrected. The idea that I took away has its own merits. I find rather strange the thought that ideas derive all their authority from the great men that thought them, and not those ideas inherent merits. Now I would be ashamed to post a pointlessly narky comment on somebody else’s blog. What is the use? Previous Previous post: The SNP are on manoeuvres. Westminster politicians should be afraid.